I have grown to love waffle making almost as much as I love making pancakes- the best part of my newly acquired skill is being able to make a big batch of waffles to freeze for the week. 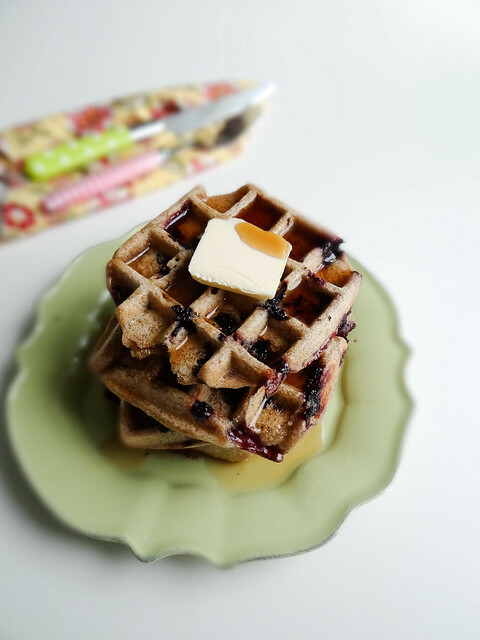 Using my sourdough starter for waffles has been amazing, especially with the warmer months ahead of us I definitely do not want to be turning on my oven to bake loaves of bread. This is where recipes for making sourdough waffles and grilled sourdough pizza come in handy. 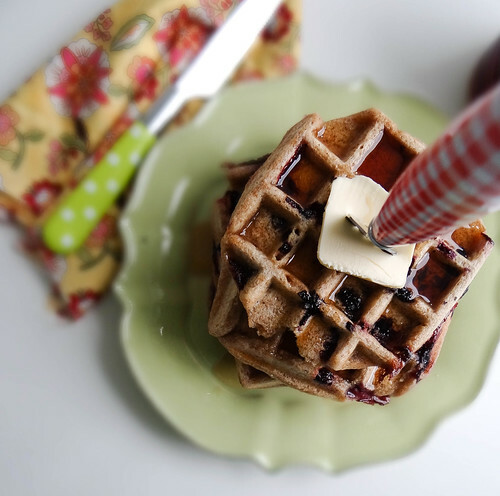 The batter base is versatile- simply sub in the cup of blueberries for your favorite berry or chocolate chips. Almond extract and other spices for the cinnamon can easily be swapped in and out- customize to your liking. Justin is very traditional and prefers pure maple syrup on his stack of waffles- I on the other hand love a variety; fruit compote or more fresh berries with coconut whipped cream - both options are amazing! I do consider myself lucky to be able to enjoy a leisurely breakfast on the weekends, I am not sure how that plays out when you have a family. Growing up we always had a big Sunday morning breakfast and on Saturday's my Dad would sometimes surprise us with donuts from Goody Good Donuts. I am not sure if my Mom would consider those mornings leisurely, but as a kid growing up they sure were fun! Do you have the luxury/opportunity to enjoy a leisurely breakfast at least once a week,or a morning routine that you just couldn't live without? Place sourdough starter through almond milk in a medium mixing bowl- stir until well mixed. Spray pre heated iron waffle and pour just under 1/2 cup into each waffle square (my maker has 2 side x side) close cover and cook according to your waffle maker. 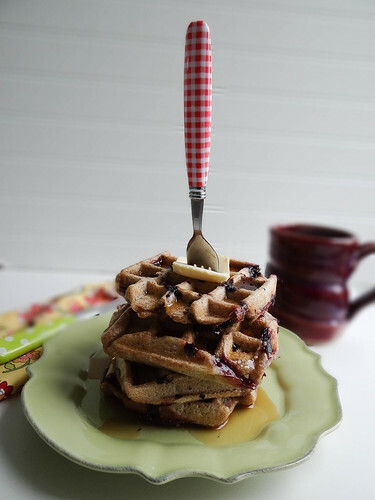 Remove cooked waffles from iron and place on a wire rack to cool before freezing or serve immediately. 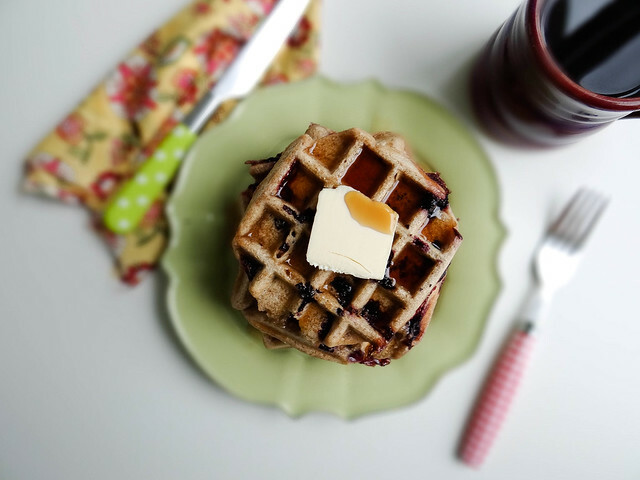 Waffles can be held in the oven at 170* until your batch is complete. Serve with maple syrup, fresh berries or coconut whipped cream. Not sure that breakfast could get more perfect than this! these are beautiful! i love these pictures so much! It has been way too long since I made waffles. My best friend is coming into town for a few days later this month, and I know it's the perfect time to break out the waffle iron. Guess I need to work on my sourdough starter now! Yummy! I love waffles! Do you know what a good sub would be for no sourdough? Can you use just flour with some baking powder or soda? We don't usually have time on the weekends for leisurely breakfasts, but these waffles are enough to remind me to MAKE the time. And make these! Thanks for the inspiration and reminder of my childhood Saturday morning breakfasts when my dad would always make us chocolate chip pancakes. Why do they have to look and smell soooooooooooooooo incredibly good? Those look like perfect little waffles! I think the only time I've had blueberries in my waffles is the Eggo variety...I tend not to order them when I go out for breakfast because they always sound so plain on menus...if I could order sourdough waffles with blueberries and cinnamon, topped with fruit, syrup and coconut whipped cream like these then I would be eating them more often! 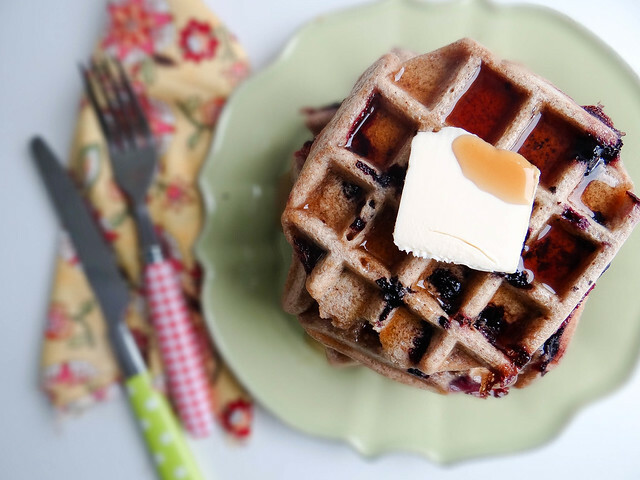 i love blueberries in waffles!! 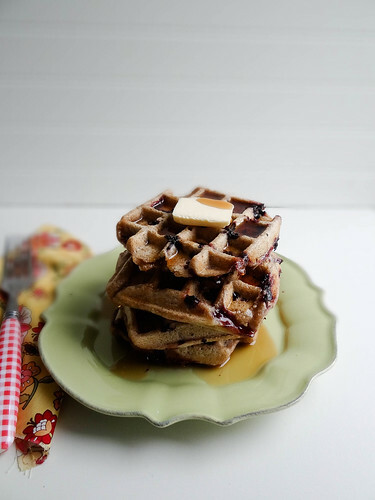 these look so perfect.. on the days when i do crave something sweet for breakfast it has to have some fruit and the sourdough is taking these waffles to my favorite breakfast list! I totally agree, that is why I love love breakfast the ritual! Waffles don't hurt either! 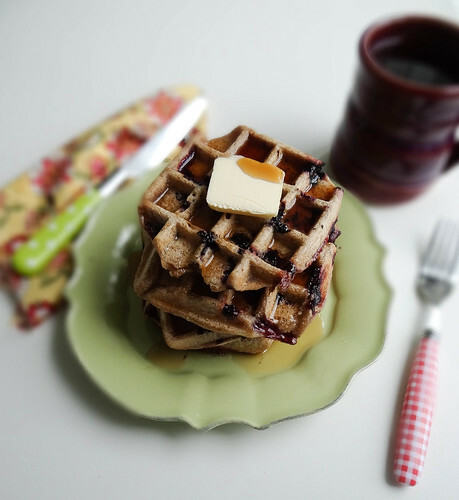 I love the waffles, they look so yummy. I love a good breakfast. I want a waffle iron very badly. But my kitchen is microscopic. So, I'm just gonna come over and have you make these for me instead. Cool? 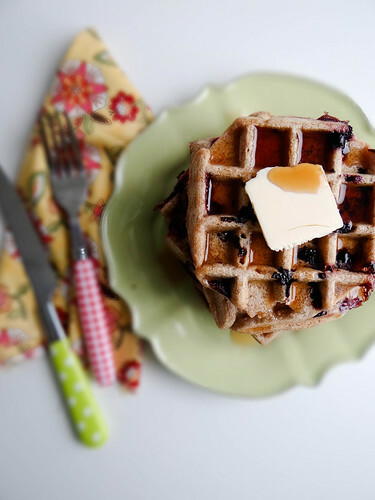 Another reason to buy a waffle iron. I recently started making sourdough pancakes with my leftover starter and I'M NEVER GOING BACK! 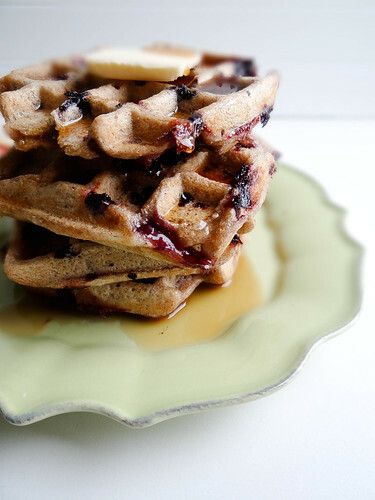 :) So flavorful and with amazing texture...I can only imagine how they would be as waffles. Even my pancake-hating boyfriend (seriously, what planet is he from?) had to admit that he liked the sourdough version. Next, I'll prove to him that waffles are where it's at!